Excellent reputations in the market, a respectful presence amongst competition, a loyalty commanding entity to its clients are not easy to attain, but we have attained it and sustained it for years. We offer seamless services in cargo carriage and handling by Ocean and Air. Our well connected Global Network enables us to offer point to point movement of consignments. Kenshine Group is uniquely positioned to handle all aspects of your shipment from end-to-end. We offer a full array of Ocean related services including Full Container Load (FCL), LCL Consolidation, NVOCC Operation, Marine Insurance, Heavylift Project Cargo, Triangle Operations as well. 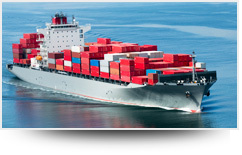 Our experienced professionals are trained to guide you through the complexities of global shipping. We can offer a single-source solution to and from any point worldwide keeping you informed of your shipment status at every step. Through our Ocean division we provide professional service with our can-do attitude. Our Team uses the latest information technology and computer systems to manage your shipment through the delivery cycle.